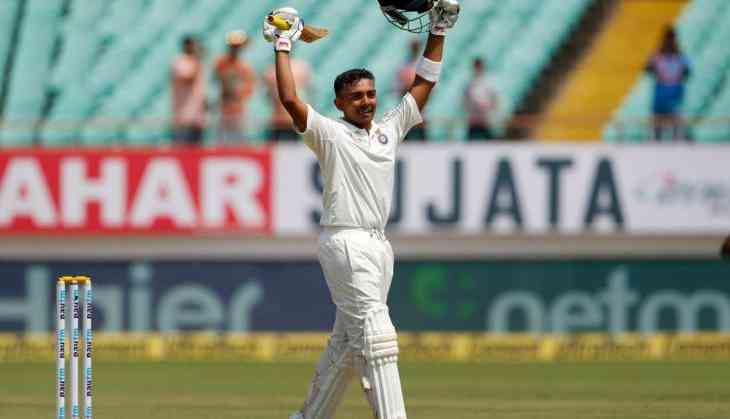 Indian batsman Prithvi Shaw, who smashed a blistering century in his debut Test against West Indies on Thursday, revealed that he tried to keep things simple while batting and did not look to do things in a different way. The 18-year-old further admitted that he was nervous ahead of his Test debut but after spending some time on the pitch he started gaining confidence. "I always try to play on my merits. In this match as well, I went with the same mindset. I did not make plans to do something different. While playing, I kept on remembering the innings I played during my first matches for India A," Shaw said in a press conference. "Obviously, I was nervous as it was my first test. But after playing first five-ten overs, I gained confidence. The ball was coming nicely on the bat, boundaries were coming. There was nothing like pressure. I was trying to dominate the bowlers as I like to do," he added. Reflecting on his non-inclusion in the playing XI for the recently-concluded Test series against England despite being named in the 17-member squad, the opening batsman stated that the selection and non-selection is something that is not in his hands. If I was given a chance to play in England, I would have tried to give my best there as well, he continued. "It was not in my hands. I was ready. If I was given opportunity in England, I would have tried to give my best there as well," he said. Shaw dedicated his debut ton to his father. Meanwhile, India ended their Day One of the opening Test against West Indies at 364/4 with skipper Virat Kohli and wicket-keeper batsman Rishabh Pant still on the crease at the respective scores of 72 and 17.